Kidney failure is when your kidneys don’t work as they should. The kidneys clean the blood and make urine. They also level out the fluids in your body. AKI is usually the result an injury, infection, or a toxin. Many long term health problems cause kidney function to decline over time. This causes wastes and fluids to build up in your blood. Care focuses on slowing the process of disease. It can also help limit further damage. You will need care for other health problems that cause stress on your kidneys. Care for AKI will focus on the cause such as treating an infection. You may get healthy enough for your kidneys to work normally. Your doctor may also change medicines you take if they harm your kidneys. Dialysis takes over the work of the kidneys. You may need it for a short time while they heal. Some people need it for life. Others use it until a kidney transplant is ready. 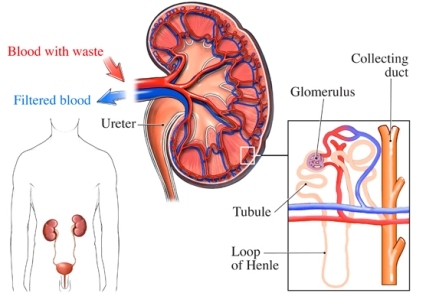 Hemodialysis —Blood with wastes is taken from the body and filtered through a machine. Clean blood is returned to the body. Peritoneal dialysis —A cleansing fluid fills the space in the belly. Wastes are drawn from the blood into the fluid. The fluid then drains out of the body. A transplant may work for some people. A healthy kidney comes from a donor. It’s placed next to the existing kidney during surgery. The new kidney should work well enough for you to stop dialysis. An effective transplant may depend on the cause of kidney damage and your overall health. Follow your care plans if you have high blood pressure or diabetes. Don’t use medicines that cause harm to your kidneys. Your doctor will make changes as needed. Drink only in moderation. Moderation is 2 drinks a day or less for men or 1 drink a day or less for women. If you’re at high risk for kidney problems, see your doctor as advised. Acute kidney injury. EBSCO DynaMed Plus website. Available at: http://www.dynamed.com/topics/dmp~AN~T566508/Acute-kidney-injury . Updated April 26, 2018. Accessed June 6, 2018. Chronic kidney disease (CKD) in adults. EBSCO DynaMed Plus website. Available at: http://www.dynamed.com/topics/dmp~AN~T115336/Chronic-kidney-disease-CKD-in-adults . Updated March 27, 2018. Accessed June 6, 2018. Gaitonde DY, Cook DL, Rivera IM. Chronic kidney disease: detection and evaluation. Am Fam Physician. 2017;96(12):776-783. Kidney failure. National Institute of Diabetes and Digestive and Kidney Diseases website. Available at: https://www.niddk.nih.gov/health-information/kidney-disease/kidney-failure. Accessed June 6, 2018. Snivel CS, Gutierrez C. Chronic kidney disease: prevention and treatment of common complications. Am Fam Physician. 2004;70(10):1921-1928. Use of herbal supplements in chronic kidney disease. National Kidney Foundation website. Available at: https://www.kidney.org/atoz/content/herbalsupp. Accessed June 6, 2018. Your kidneys and how they work. National Institute of Diabetes and Digestive and Kidney Diseases website. Available at: https://www.niddk.nih.gov/health-information/kidney-disease/kidneys-how-they-work. Updated March 2014. Accessed June 6, 2018. 1/4/2011 DynaMed Plus Systematic Literature Surveillance http://www.dynamed.com/topics/dmp~AN~T905401/Anemia-of-chronic-kidney-disease : Deved V, Poyah P, James MT, et al. Ascorbic acid for anemia management in hemodialysis patients: A systematic review and meta-analysis. Am J Kidney Dis. 2009;54(6):1089-1097. 10/10/2013 DynaMed Plus Systematic Literature Surveillance http://www.dynamed.com/topics/dmp~AN~T908720/Chronic-kidney-disease-mineral-and-bone-disorder-CKD-MBD : Di lorio B, Molony D, Bell C, et al. Sevelamer versus calcium carbonate in incident hemodialysis patients: Results of an open-label 24-month randomized clinical trial. Am J Kidney Dis. 2013;62(4):771-778.